Does what we are capable of doing define us as human beings? If this basic anthropological assumption is true, where can that leave those with intellectual disabilities, unable to accomplish the things that we propose give us our very humanity? Hans Reinders here makes an unusual claim about unusual people: those who are profoundly disabled are people just like the rest of us. He acknowledges that, at first glance, this is not an unusual claim given the steps taken within the last few decades to bring the rights of those with disabilities into line with the rights of the mainstream. But, he argues, that cannot be the end of the matter, because the disabled are human beings before they are citizens. “To live a human life properly,” he says, “they must not only be included in our institutions and have access to our public spaces; they must also be included in other people’s lives, not just by natural necessity but by choice.” Receiving the Gift of Friendship consists of three parts: (1) Profound Disability, (2) Theology, and (3) Ethics. 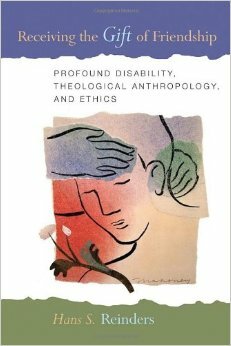 Overturning the “commonsense” view of human beings, Reinders’s argument for a paradigm shift in our relation to people with disabilities is founded on a groundbreaking philosophical-theological consideration of humanity and of our basic human commonality. Moreover, Reinders gives his study human vividness and warmth with stories of the profoundly disabled from his own life and from the work of Jean Vanier and Henri Nouwen in L’Arche communities. From the publisher.